Longtime supporters know that since 2011, I’ve called for new rules that would require trustees to file annual financial disclosure statements. It’s the same thing that Pennsylvania’s Ethics Act requires public officials to do, and it would lead to a more transparent and accountable board. But recently I was surprised to find out that the Ethics Act already applies to some trustees. In addition to those who are public officials, the board members who are appointed by the governor must also follow the law. That means trustees like Ira Lubert can’t use their office for personal gain. Board members like Paul Silvis and Mark Dambly can’t accept gifts in exchange for votes. And if any of those trustees break the law, they face a fine of up to $10,000. But the most important part of the Ethics Act is the annual Statement of Financial Interests. These filings with the state Ethics Commission list trustees’ income sources, so the public can keep an eye out for conflicts of interest. For some reason, most of the governor’s appointees haven’t filed a financial statement since 2010. I asked them why, but none responded. You can search the public filings here. But the available reports provide a small window into how their business activities might influence their decisions as board members. Ira Lubert hasn’t filed a disclosure form since 2010. The Philadelphia real estate mogul listed 12 nonprofit and for-profit companies that he serves or works for, along with a whopping 102 other companies that he owns or partially owns. And that’s only half of the companies that he has a financial stake in – a note on his form says he has a stake in more than 200 companies. Three of the listed companies have addresses in State College. One, PSRP Developers, leases office space to Penn State for $1.1 million a year. Another, Pennwood Village apartments, appears to be typical a student housing complex. The identify of a third company, Allen Street Associates, is murkier. It’s registered to Edward Friedman, a State College real estate tycoon who owns Friedman Real Estate Group. Kathleen Casey, a recent board appointee, is the only gubernatorial trustee to file a financial statement in the last two years. In 2011, when her term as commissioner for the U.S. Securities and Exchange Commission expired, she listed Strategas Securities and the SEC as income sources. On her 2012 form, she also listed Georgetown University, Washington, D.C.-based Patomak Global Partners, and KLC Consulting Group. Board Vice President Paul Silvis, the “head coach” of Bellefonte-based Silcotek, listed that company, along with Restek and the Redline Speedshine car wash as income sources on his 2009 form. Mark Dambly, another Philadelphia-area developer and president of Pennrose Properties, listed a number of companies that he fully or partially owns on his 2009 and 2010 statements. Peter Khoury, a student, listed no income sources on his 2010 form. Alvin Clemens, who owns a small healthcare firm that offers “hospital driven health care,” listed that and “investment income” as income sources on his 2009 form. All trustees should be required to file statements like these. 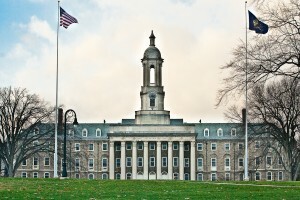 Even if the Ethics Act doesn’t apply to Penn State, there’s no reason the board can’t decide to apply it on its own. Thanks Ryan for your tenacity and integrity. I appreciate the information you provide. Remember that David did overcome Goliath.